Every season the painfully drawn-out spectre of relegation for fans of struggling clubs holds far more dread than the final, mathematical certainty that your team is going down. Usually by that point months of bad results has meant that resignation has long since set in, and a stoic glance at the clubs in the league your side will face the following season represents some small token of positivity: ‘Surely we can beat this lot? Can’t we?’. Falling out of the English Premier League, with all its wealth and prestige, is one thing – after all The Championship below it is one of the most competitive leagues in Europe, boasting big clubs with grand stadiums (and painful though it may be, at least your team is still a part of the institution of the 92 clubs that make up League football in England). No, money aside, the greater shock to a proud club with a long history is the trap door out of the Football League entirely; those last two positions in the basement division of League Two sending you into unchartered waters, and the netherworld of the Non-League. For the likes of recent victims such as Stockport County and the Rovers from Bristol and Tranmere, it is a culture shock that can either make or break a club teetering on the edge. Seldom is there any middle ground for these clubs steeped in decades of Football League participation. The transformation from away days to Portsmouth and Plymouth being replaced by days out at Braintree and Bromley produce either a revitalising bounce after years of struggle in League Two, or a more terminal decline of a club institutionally in a complete mess. For Bristol Rovers, a season in Non-League helped turn them around to such a degree that promotion back into League football was followed by another a year later into League One. 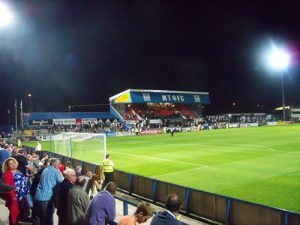 For Stockport, one relegation was met with another – a proud club tumbling even further down into the Non-League pyramid (For Tranmere – League Cup finalists as recently as 2000, they find themselves at a crossroads in their second season outside the Football League. Which way they go remains to be seen). 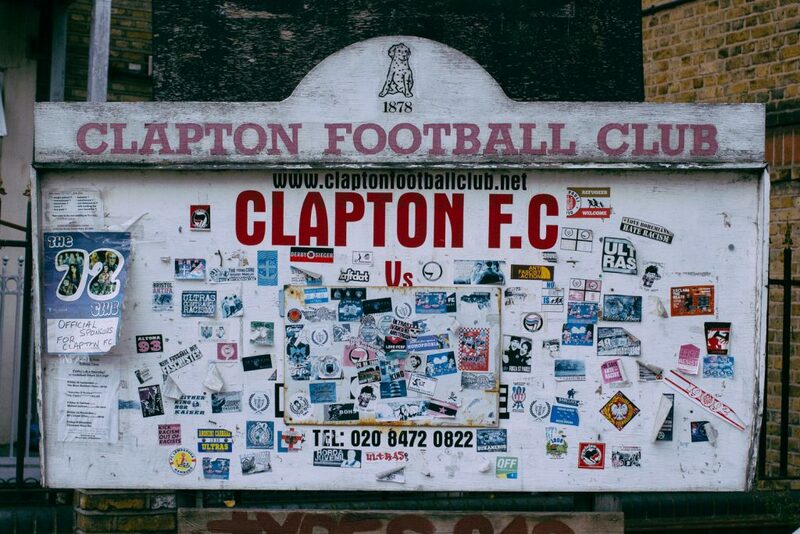 Relegation into Non-League’s top-flight really isn’t deserving of the dread and horror that most perceive it to be. The Vanarama National League (formerly the Alliance Premier, Gola, GM Vauxhall Conference and Skrill Premier in years gone by) is a wonderful melting pot of ex-Football League teams licking their wounds, traditional giants of the Non-League world, and newer upstarts that have come up through the leagues in quick succession. It is a mix that produces a very competitive league, the top half of which could arguably hold their own in league football quite comfortably. Financial miss-management in the National League is dealt with severely in comparison to its Football league counterparts. Enforced relegation can and does happen if a club over-stretches itself, and is unable to return to the levels of sustainability that is demanded. The knock-on effect is a league of largely well-run clubs, some punching well above their weight by competing with sides with far greater resources. Teams that go up into the football league, schooled by The National League’s demands for financial prudence and responsible management, often find themselves in a position to compete for promotion straight away. Yeovil, Fleetwood, and Crawley have joined Bristol Rovers in a quick double promotion into League One in recent times. 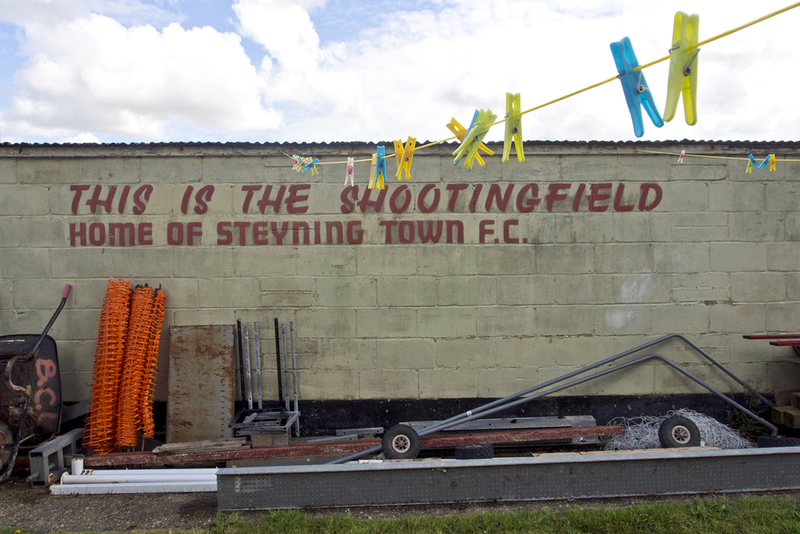 With its demands for financial fair play and sustainability, The National League has produced an environment in which honest, hard-working clubs can thrive. 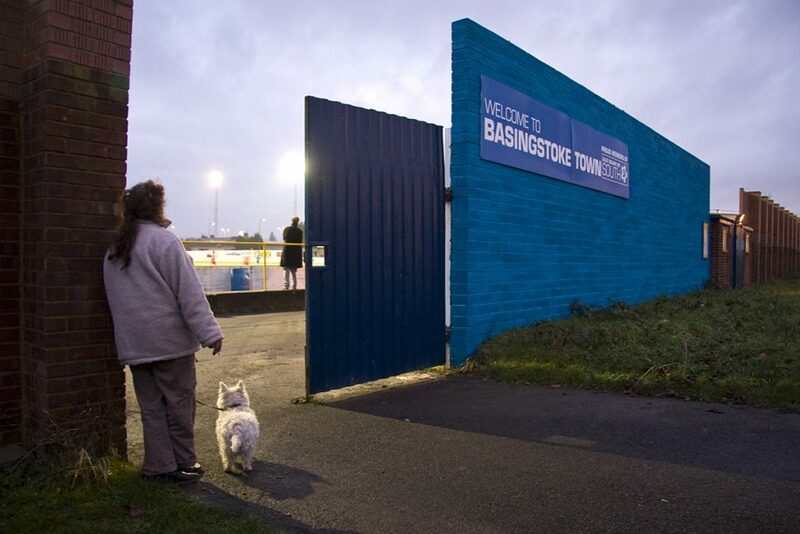 Yes, some do have wealthy benefactors that can write off debt if it is accrued – but if they disappeared, so would the overspending if the club wanted to remain at the pinnacle of the non-league game. On a warm summer’s day, only two games into the fledgeling season, Macclesfield Town’s General Manager Rob Heys helped underline the refreshing realities of National League life. As the groundsman, Gary, lugged hoses about the pitch to water it ahead of that evening’s match against Southport, Rob explained that there was no money for an under-pitch sprinkler system, so for the time being poor Gary would have to continue with this time consuming and back-breaking task. Indeed, there was no money to pay Gary much more than minimum wage, let alone pay for sprinklers. ‘The going rate for a head groundsman is probably three times what we can pay him. But he does the job on the money we have because he loves it, and he loves the club’. Walking around The Moss Rose, Macclesfield’s home, volunteers help out where needed, setting up the shop, answering calls in the office. ‘We couldn’t do it without them. But they do it willingly, donate their time. It is their club, their community, it is real football’. A season in and around the play-offs, and a chance at glory in the FA Trophy constitutes a good season so far for a club with limited resources such as Macclesfield. For others in the National League, however, ambitions are a little higher. 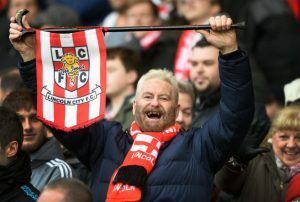 While league leaders Lincoln City have captured the hearts and imaginations of the country with their FA Cup heroics, beneath them the scramble for promotion to the promised land is hotting up. The small town of Nailsworth, nestled in an isolated and picturesque valley among the rolling Cotswolds seems an unlikely location for league football. But that is what Forest Green Rovers are hoping for come the end of the season. 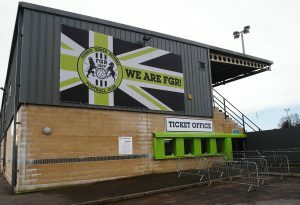 With close to 20 years uninterrupted membership of Non-League’s top flight behind them, Forest Green are not your typical club. Owner Dale Vince, and founder of Ecotricity – a green energy electricity provider, has not only enabled successive managers to build a team capable of promotion, but he has transformed Forest Green into the world’s most ecologically friendly and vegan club. An organic pitch, solar panels that help fuel the club’s electricity needs, power sockets for electric cars in the car park, and a completely vegan menu all served up in biodegradable punnets suggest that Forest Green look outside the traditional box. Even the milk for your half-time cup of tea is soya! The New Lawn is an impressive little ground that fills up beneath storm-laden skies with a crowd of 1,500; remarkable given its relatively rural isolation. As with Macclesfield’s encounter with Southport earlier in the season, Forest Green’s match against Woking helped prove that the all-important product out on the pitch is every bit as competitive as you might find in League Two, possibly even the lower half of League One. Despite Woking’s lowly league position, they try to play the ball about with a similar intensity and attractive passing style as their hosts – though it is Forest Green, who have been in the top three since August, who carry the greater threat. And it is no real surprise when Keanu Marsh-Brown finally converts one of Forest Green’s many chances to give them the lead. What is a surprise, however is Woking’s response when, just before half-time, defender Joey Jones drives forward with the ball and lets fly from a good thirty yards, lashing it into the roof of the net. If that isn’t a fatal blow, then Gozie Ugwu’s fantastic diving header just after the break looks like it might be for Forest Green. Despite the better chances, and a majority of the possession, there is a creeping sense that conceding two world class goals against a team at the wrong end of table could well mean that lady luck is not on their side. However, good teams create their own luck, and the hosts set about turning round a tricky situation, fully aware that their rivals at the top won’t be dropping many points now the season is coming to a head. Christian Doidge literally wills the ball in from a corner for his 17th goal of the season, before a well-worked move results in substitute Omar Bugiel prodding home a cross for the lead, just as it looks like time is running out. As Woking go in search for a late, late equaliser, Bugiel breaks away and finishes a brilliant solo effort by curling the ball into the far corner, to send the crowd, and the PA announcer into delirium. A third goal in the dying seconds by Woking’s Terell Thomas dampens the mood a little, but at the final whistle, the home support rises to its feet, enthralled and relieved in equal measure at a seven-goal thriller; while on the far terrace, 110 Woking supporters gloomily trudge away into the driving rain, folding away flags that had been attached to stanchions, ready for another away trip. As the Woking support begin their journey home considering their plight at the foot of the table, it’s hard not to consider also the two disallowed goals, a missed penalty, and the most unlikely of international match ups between Woking’s Antigua and Barbuda midfielder Keiran Murtagh, and Forest Green Rover’s Jake Gosling – a Gibraltar player who had scored against Poland during his nation’s fledgling FIFA sanctioned history. Seven goals, all this, and a neat passing game of football helped cement the notion that life outside the Football League isn’t as bleak a proposition as some might think. Indeed, from The Moss Rose in Macclesfield, to The New Lawn in Nailsworth, via Lincoln and Sutton’s heroics in the FA Cup, The National League is every bit the competition those at the top are trying to reach – which is why clubs like Woking and Southport are fighting so desperately to stay in it at the wrong end. It is an institution close to its 40th anniversary. Here’s to another 40 years of the wonderful world of the National League. Mat lives in Southampton with his wife and, if he were allowed, a cat that would probably be called Stanley. He had supported Southampton and Salisbury since he was a young boy and has written about football for The Football Pink and Stand Magazine, as well as on his own blog Dreams of Victoria Park. His wife won’t let him have a cat. He has written two books: 'Another Bloody Saturday: A Journey to the Heart and Soul of Football', Published November 2015, and 'Minnows United: Tales from the Fringes of the Beautiful Game', due for release in the Summer of 2017. Once upon a time, to leave the league was a real ending. When sides such as Workington, Barrow, Southport & others failed to be re-elected to the league after years of failure they were not relegated into a pyramid system with a way back, but were instantly forced into part-time regional football or to go under altogether. Since the creation of the Alliance Premier League in the 80s, and promotion and relegation into and out of the "92", the dynamic has changed. Lincoln City were the first to be relegated to what became The Conference and they committed to staying full-time and were able to get back at the first time of asking. 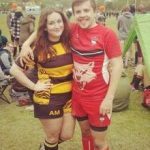 (The dubious roughhouse tactics they sometimes used are neither here nor there)! Relegation is always unwanted but if the club is set right it isn't the end of the story. In addition, some fun is always to be had: Tranmere's adventures in the FA Trophy this season for example, especially their slighty queasy bromance with South Park FC, can have given their supporters nothing but joy. Nice article, always lovely to read about real football. I am obsessed with the last pic, where is it? 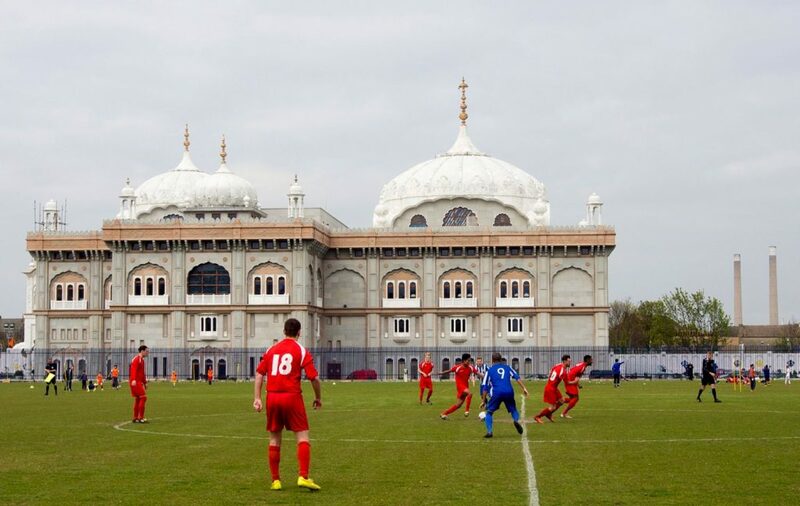 I believe it's the home of Guru Nanak FC!